Ending the week as it began wet but thankfully this time not quite so wild. Last weekends storm was amazing giving us over three inches in the gauge in less than an hour. Causing a good deal of damage and sadly the loss of a young couples lives. The chickens were at full attention as always waiting for their morning vegetable scraps from the kitchen. Very excited at the prospect of snacks to start the day. 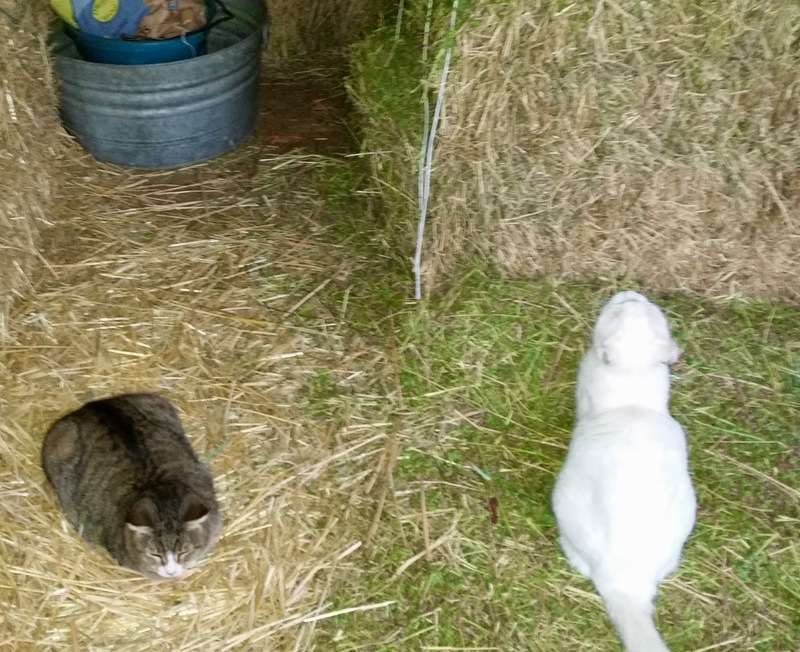 Barn cats Tabby-tab on the left and Snowy River love it when Fall rolls around and there is an ample supply of winter hay stored in the barn. Makes for warm naps until next Spring comes around. Everyone gets frisky when the barometer starts changing and Sherman and Yarrow are no exceptions.The anticipation of more cool , wet weather for our drought struck state gets everyone excited! Remember the fodder of last Friday? Progress is being made daily and now on day 8 I am expecting to begin feeding it Sunday or Monday. The chickens are still enjoying the leftovers from the garden. Getting either a leafy tomato plant or pepper plant daily. Nothing goes to waste on the farm and after all that the flock will consume is gone the rest will be roter tilled under. 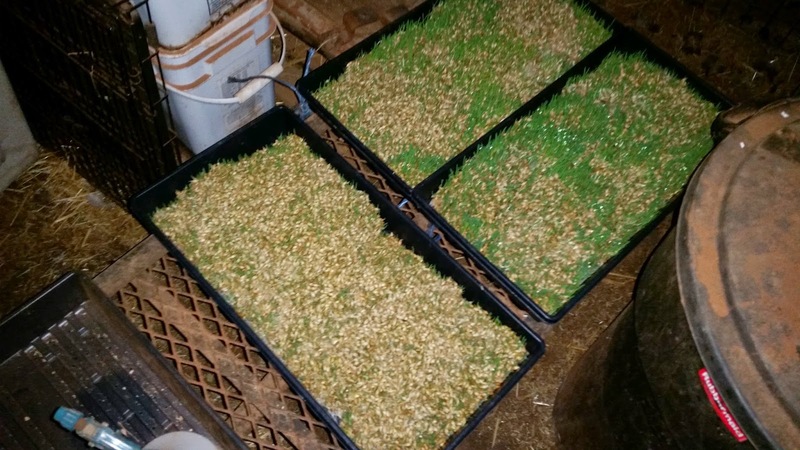 I am looking forward to seeing how they enjoy my first fodder efforts and will be starting some more trays next week also. 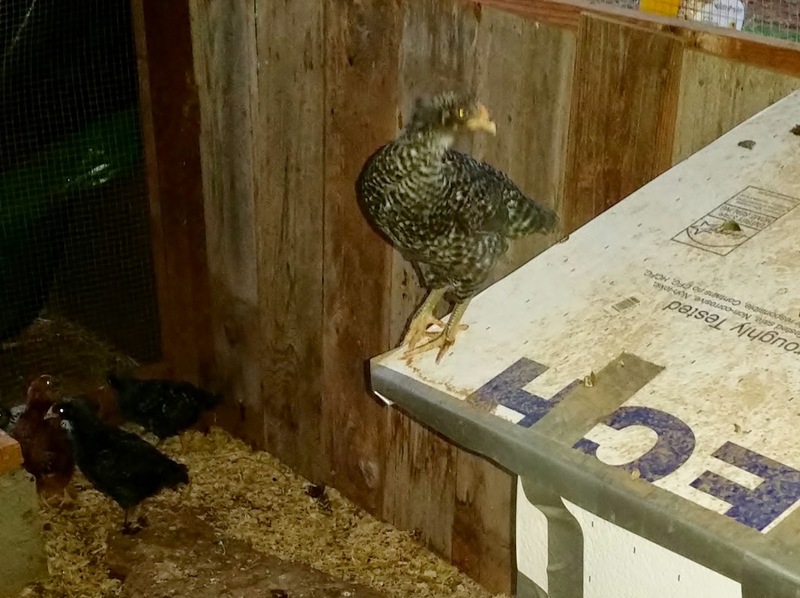 So this Plymouth Rock pullet has become the first to take to the wing and daily fly's up to the top of the coop area in the larger coop. Guess it is time to expand their horizons. Have a wonder filled weeks end and those of you fortunate enough to have some days off enjoy! It will be a busy weeks end here with a trip to the big city Redding for supplies and then on Sunday a *real* trip to Napa for a meeting of a Great Pyrenees rescue I work with . I will be taking some photos to share and will be visiting with you all next week. Thank you for stopping by ! Just love a morning such as this! If you look carefully to the top right of the solar panel you can catch a wee bit of Mt. 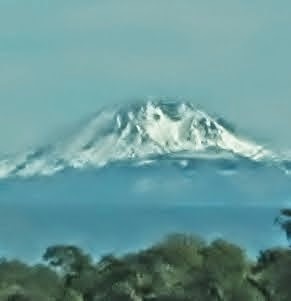 Lassen wearing a more regal coat of snow then in the last post photo. 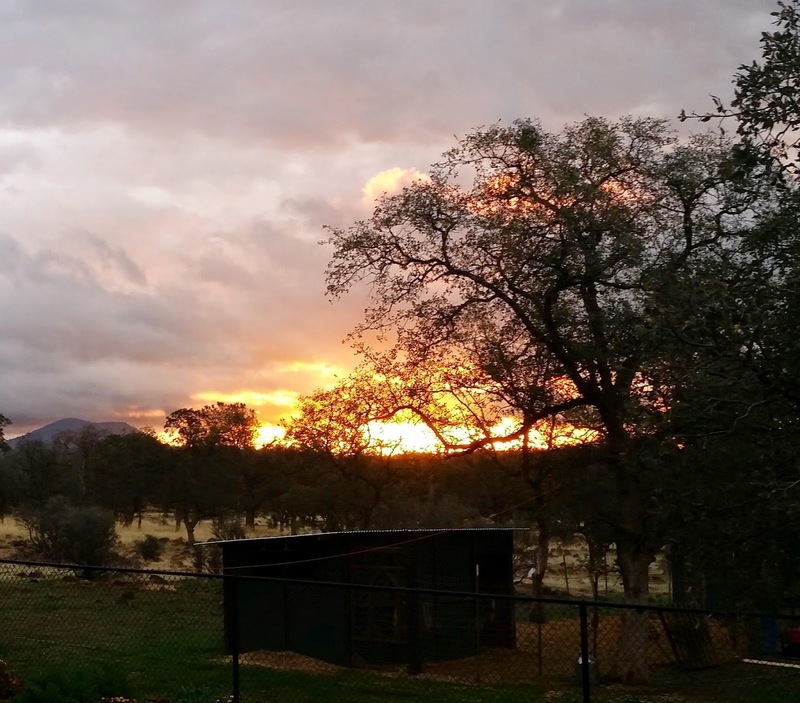 We got a wonderful gift on Saturday in the form of everything that could be snow on the higher mountains (we are at 1000 ft) wind, rain and hail in various degrees in the lower mountains and the valley floor. The lucky fellow walking in the downpour is my husband Geoffrey. He is checking on potential flooding and the welfare of the critters especially those 34 then twenty four day old pullets. All was well with the exception of the doe barn to the right of him which had a bit of a wash out in it. Since this is the first storm of this nature this season it was all thankfully sucked up by the thirsty ground. So I was able to give the does and their Pyrenees Sherman and Yarrow a thick bed of dry fluffy straw when I went out later to milk . After chores this morning I made ready the oven for a loaf of my favorite bread. I often hear folks say "I would love to make my own bread but it takes time". Well yes it does but if you really desire to have the crunch and flavor of homemade breads you can make it happen. I had a friend at one time who would mix up her bread and let it rise in her Volvo on the shelf beneath the rear window as she went about her day of errands and appointments. She had two pans at the ready to handily pop the dough into from the rising bowl when it came time for that last rise. Her family never lacked a loaf of fresh bread daily. I realize this isn't possible for everyone to do but we have so many amazing recipes now anyone can find a way if they have the will. The recipe I love and will share with you is a great bread that can be augmented in many ways giving you everything from a more traditional artisan loaf for sandwiches , soups and such . Add some nuts, dried fruits and you have a yummy breakfast bread. And it is a lovely no-knead bread that goes from mix to bake over night with little effort on your part. Below is a link with her recipe for No - Knead Wholegrain Bread. I have made this bread many times either whole or half recipe and a multitude of ingredients. It always comes out perfect and I mix up it just before bed the night before and bake it after morning chores. Today's bread was a yummy concoction that included 9 grain flakes, red flame raisins, dried apple pieces, sunflower seeds in addition to the flax seeds and quinoa. All ingredients are organic and sourced as local as possible. Just this side of Heaven hot, crusty with real butter . So challenge yourself. Make time for those things that intrigue you. The simple things in life that bring you back to your roots. The day after a good rain brings sun to give us a day to be grateful for the rain and to catch up on those things that didn't get done when the rain was falling. So we were up early looking forward to a day full of progress. Hidden behind the oak tree on the left is the snow capped top of Mt. Lassen . She got a good dusting yesterday adding to the smidgen she got about a week ago. We are only about half an hour from the mouth of Mt. Lassen National Volcanic Park so we have a good view of her especially in the dead of winter when the oak trees are missing most of their leaves. Out to check the pullet chicks. They are growing like weeds and today after adding more feed and water to their offerings I moved the heat lamp up a bit higher. Imaging that between their growth and feathering by early next week we can forgo the heat lamp altogether. Then after finishing up feeding chores and taking the working Pyrs Sherman and Yarrow out for a bit it was time to move on to laundry. We are off grid here at Walnetto Farm and even though we do have propane back up we strive to use it as infrequently as possible. 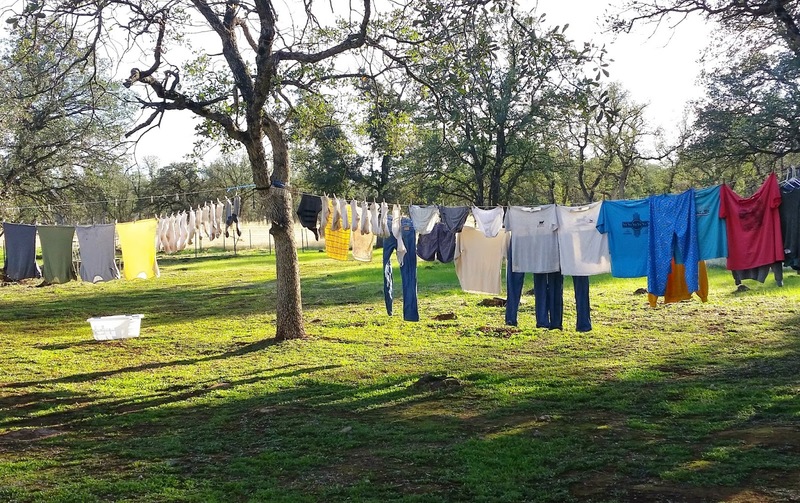 So even in the fall and winter I have discovered if the day brings sun, a slight breeze and a high temperature of at least fifty degrees I can hang out laundry with good results. Next on the list was finally getting the fodder going. 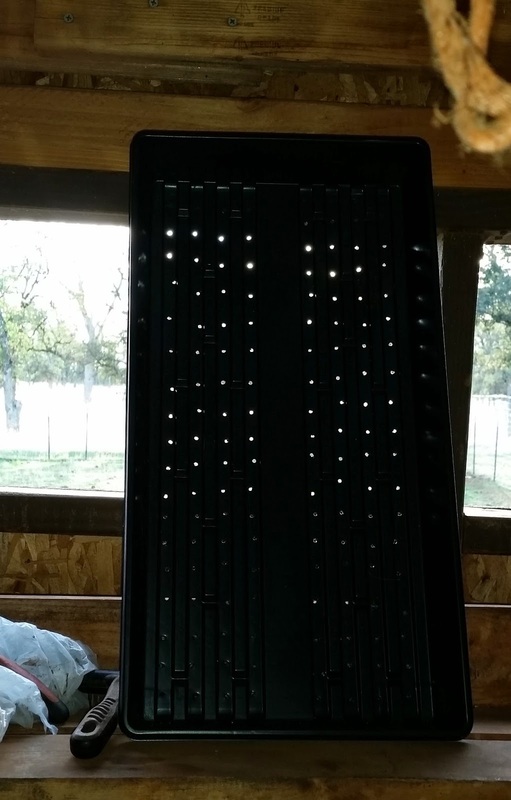 I sat down in the milk barn with my drill and the five growing trays I had bought and began drilling holes in them about 1/2 inch apart . Then I added about a pound to each tray of organic whole barley that had been soaked during the rain day and left to drain all night. It was still quite moist today and I will spray it several times a day until it begins to sprout and grow into fodder to offer the chickens. Think of glorified sprouting. Below is the pre drilled growing tray . The barley soaking in water that covers it for 12 hours. 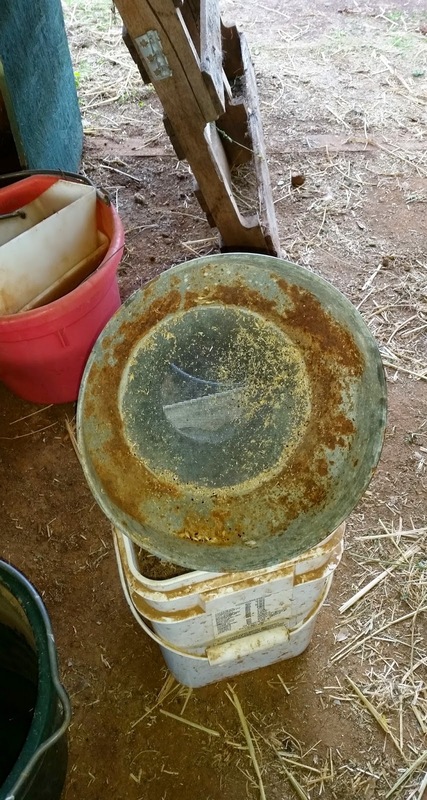 Center is the top portion of what used to be a metal filter for milk being poured from milk pail into a larger milk tote (some hold up to 5 gallons) while the screen acted as a filter. There may have even been some kind of gauze cloth or perhaps paper filters as we have now. It is pretty dated so I don't know. But it is perfect to drain the barley in after soaking before placing into the trays. 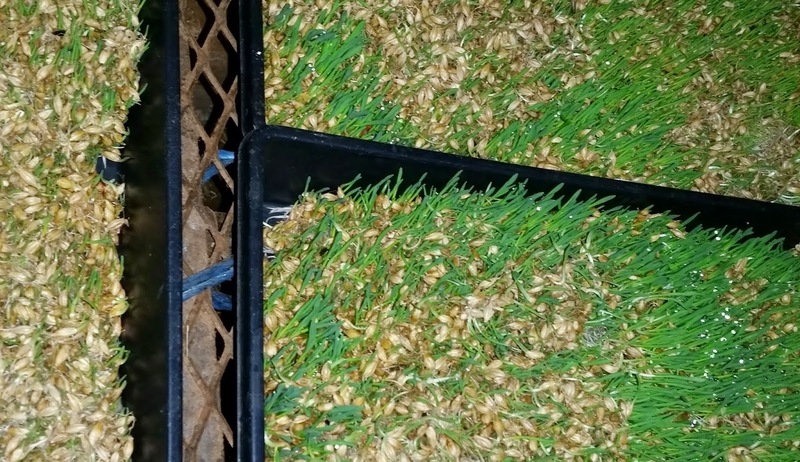 I then place the barley in the trays and will thoroughly wet it at least three times daily until it has grown to the length I desire for feeding. 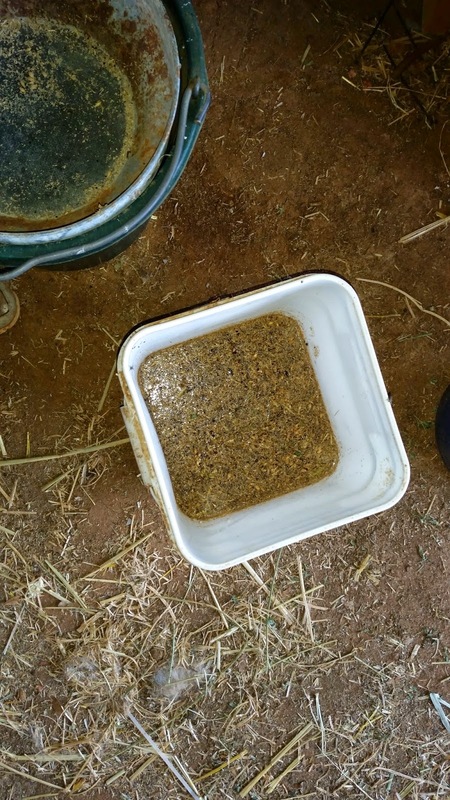 For now I am only using it for my chickens I will determine if I use it for the goats at a later date. Please note technology only works when it works. I have tried to resurrect my old blog Life on the Farm but nada , no isn't having none of it! So here we go again. Lots of changes on our "42 acres of paradise". A smaller herd of LaMancha dairy goats , a larger flock of chickens including 34 almost four week old pullets. 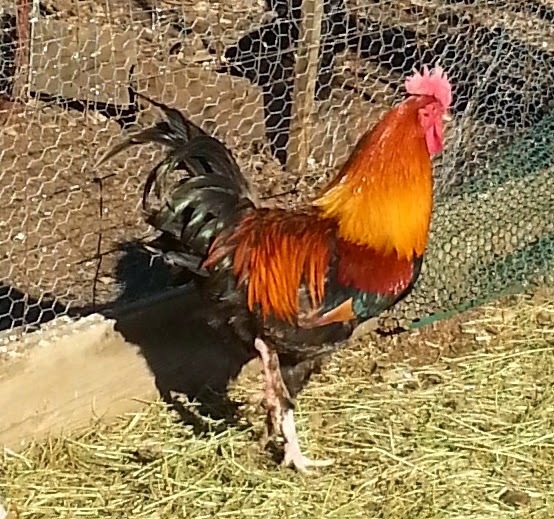 Please note this is no pullet . May I introduce "Robert Redford" a lovely Wheaton roo and a perfect gentleman. The weather is changing as we visit. Rain is falling and we most certainly won't complain since we will need a lot of it to bring us up to "normal" or better. I am getting into winter mode. Which means more spinning, weaving and quilting. More warm meals and baking. And more time for blogging. I am still on Facebook but am going to be there less as time goes on. Our world is spinning and many folks are making drama a way of life. I believe that with the exception of instant communication with my family still in the Valley there is not much there for me at this point. So as odd as it may seem I am going back to a gentler time of blogging. Seems odd to say that but tis true. So with that said if you are new to the blog or have found us again from following before welcome back or welcome for the first time. I hope to make this new blog one of sharing our way of life and gentler times. In hopes that it can be seen that there is life without continual narcissistic drama but still a lot to be shared. Hope to see you here often.